Coloring is all the rage right now, and if you're someone who likes to color I think you're going to like the tip I have to share about this card. Actually I have 2 tips, one is a money tip and the other is a product tip. 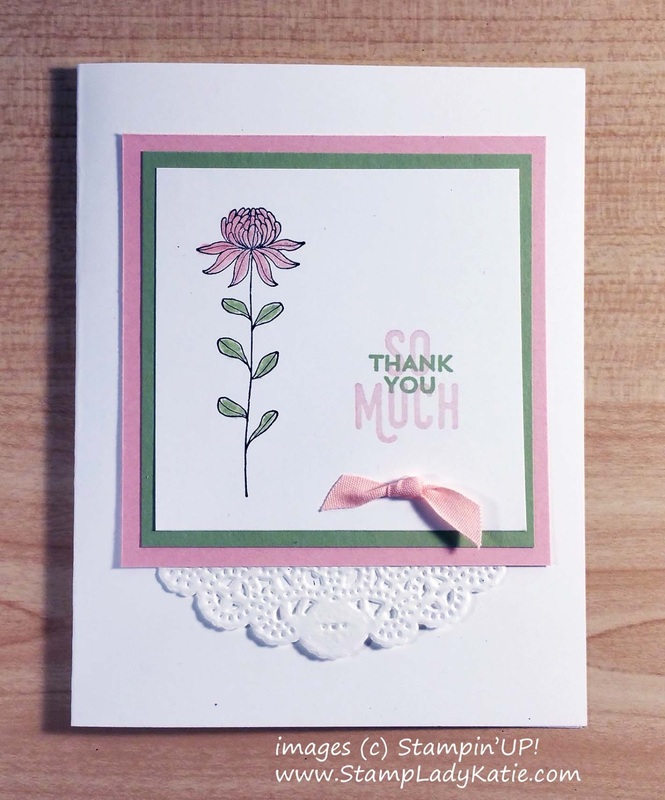 The flower is from one of this year's Sale-a-bration sets: Flowering Fields. 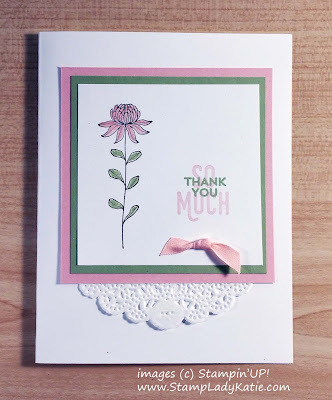 For those who don't know about Sale-a-bration its Stampin'UP!s one big sale of the year. Each $50 purchase earns you a free choice from the Sale-a-bration brochure. You can't buy the Sale-a-bration items, they can only be earned with the qualifying purchase. Check out this year's amazing choices here. Wonderful options right? Is there 1 or 2 you're thinking you'd like? Are you starting to think about a qualifying order? Its EACH $50, so a $100 order gets you 2 choices and so on. How long is your Wish List? - Actually I have several customers who stock up on consumables during Sale-a-bration just so they can get the Sale-a-bration items they want. Now, back to today's project. It might be kind of hard to notice in the big photo above but check out the sparkle on the flower in this close-up. The sparkle comes from the Wink of Stella Clear Pen. 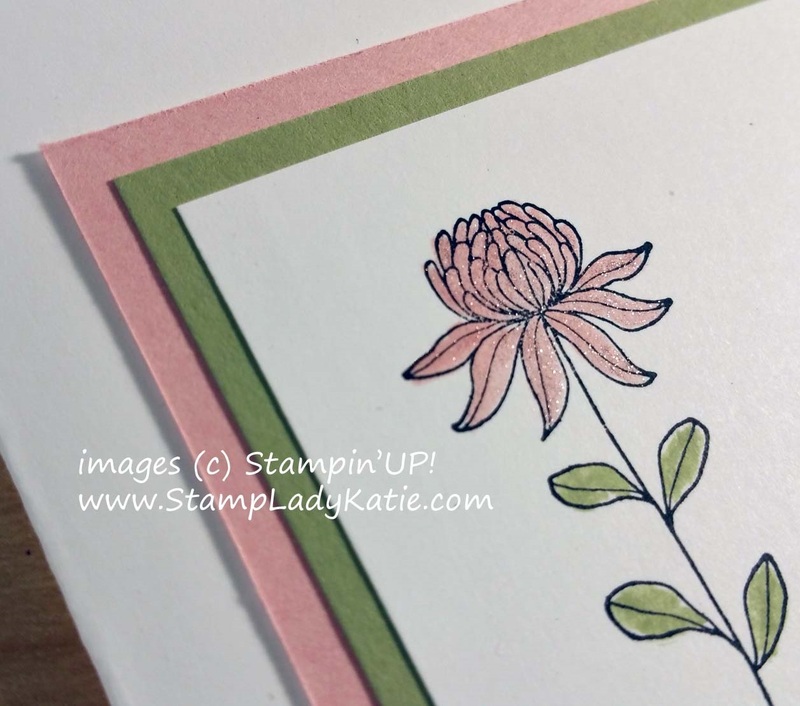 The brush tip is long and very pointed so you can do really nice detail coloring. Since this is the Clear pen you can color with the marker and then paint over the color with the Wink of Stella. But here's my tip - you can use the Wink of Stella pen just like an Aqua Painter. Thats right - you can dip it directly into an ink source and paint both the color and the sparkle in one pass. Word to the wise (as in learn from my mistake). Don't pick up color directly from the ink pad. I know this because my Blushing Bride ink pad is VERY SPARKLY right now. I have to figure a way to get all the Stella off of it. I suggest you use a drop of re-inker instead.